Virtual Private Server (VPS) vs Dedicated Server : Which one do you need? Web hosting is one of the major things behind the success of all the online services. The performance, speed, and uptime of your website depend mainly on the kind of hosting you use. For big business, there is mainly 2 type of hosting which are important, one is Virtual Private Server (VPS) and the other one is Dedicated Server. In this post, I will be writing an in-depth comparison of these 2 types of hosting, so that you can take your own time reading the post and decide accordingly keeping factors like price, performance, and features in mind. Before starting the comparison. Let me first tell a bit of brief about both kinds of hosting. When you are using a dedicated server for your hosting, you have full control over the system and resources. A dedicated server means that you have purchased a server where your hosting company is located. The hosting company is looking for the resources and maintaining your server, however, you have complete access to it and you can customize it in the way you want. Practically, dedicated servers are the fastest and most reliable way of hosting for the current day customers. However, there are times when some high-end VPS might compete with dedicated servers, but that is a rare case. Just like the name, dedicated servers offer a dedicated service to make sure your online website gets the most of performance and speed. Virtual Private Server is mainly used by the websites and business having a decent amount of traffic. There are several virtual systems installed on a single server, that means you get a separate hosting but on a shared server so that you can get the features of a dedicated server at very low price. Some of the best VPS hosts are even better than dedicated servers when it comes to performance. These days, VPS hosting is becoming really popular because of the cheaper rates and better performance. Once I am done with the little introduction, let me compare both the type of hosting on some basis. In dedicated server, you have full access to the resources, be it the RAM, the hard disk space or the bandwidth and the CPU, whereas, in case of a Virtual Private Server, there are many virtual machines running on the same server, in that case, you get the capacity of RAM, storage and bandwidth which is assigned to you by your hosting company but the CPU process is shared by all the accounts on that server. In dedicated hosting, you do not need to share anything with anyone else, so you have the option to utilize more computing power as compared to VPS owners. Well, being honest, you do not always need that much of computing power (CPU memory) because the main things needed for a website are bandwidth and RAM. 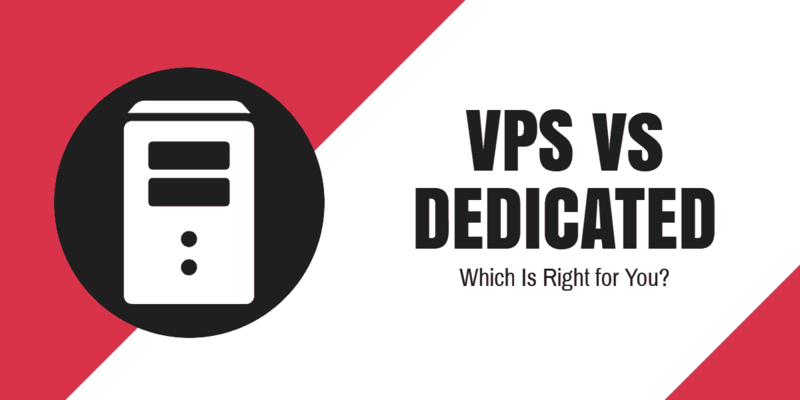 In flexibility, VPS is better because you need to pay only for the resources you are using. You can always scale up or down whenever you feel a need of it. With the growing business, you can ask your hosting company for more resources and you will get the resources after paying the difference amount. In case of dedicated hosting, you manage the system directly and it becomes pretty hectic if you ever want to scale up the resources because that leaves an impact on the performance of your website, while in case of VPS, the company takes care of the process and chances of your site getting affected are minimal. VPS are mainly managed, so it gives a great comfort when you are trying to change server and in terms of dedicated server, migration becomes a pretty hectic task. In this segment, almost both VPS and Dedicated Server work same. In both the options, you have control over the machine, well, that’s another thing that in one option, you have the OS installed on the physical machine and in another option, you have OS installed on a virtual machine, but performance wise, both the options work fine. Users do not see much of difference between these 2 because they get the root access and full control over the server. Sometimes, even it becomes important on which software you are using on your VPS or dedicated server. With the VPS, hosting companies often provide Cpanel, which is a very popular way of managing your websites. This is the MAIN FACTOR of the difference between Virtual Private Server (VPS) and Dedicated Server. There are several VPS hosted on a single server and that is the reason a VPS costs much less than a dedicated server. A dedicated server is a private property to you and you will need to pay the whole amount yourself. Dedicated server hosting with decent configuration often starts from around 100$/month and VPS hosting starts from as low as 5$/month. Some of the most popular VPS hosting providers these days include the likes of Amazon Lightsail, Linode, Digital Ocean, Vultr etc. I am sure you must have got an idea about both these hosting options. It solely depends on your decision and your budget because there is not much of technical difference between these two. However, before going for a VPS, go through some VPS hosting reviews. I hope this post was useful. Let me know if you have any doubt and I will try my level best to solve that out for you. Harsh contributes articles related to latest technology, web hosting, SEO and wordpress.